I studied this collection in depth at ALevel and I grew to hate it as it became tangled up with the stress of practice essays, revision and ‘getting the right answer’. When I actually sat down in the exam I ended up not even writing about it and still getting an A when it came to results day. Revisiting this book almost a year after my ALevel exams as part of my university course was a strangely nostalgic experience, many of the interpretations my ALevel teacher gave me weren’t mentioned by my lecturers or seminar group and it was interesting to reread this collection without having to find the right answers, I could read the whole collection from my own perspective and as long as I could justify my opinions my seminar tutor would nod and put my point out to debate. Now that I’ve finished on that tangent, down to the actual review of the book. The Bloody Chamber is a collection of Gothic short stories varying in length and style drawing influences and references from a variety of traditional fairytales, many of which we are all aware of from Disney adaptations. Far from simply putting a dark or feminist twist on these traditional childhood fairy tales Angela Carter creates distinctive re-writings of them in a style that is distinctively hers. When reading this collection it feels as though every single word has been chosen for a reason, it feels like a great privilege to read a collection that is so richly descriptive . Some of the imagery is brutal, some beautiful and some wonderfully comic. The collection is also distinctively self-conscious, Carter knows exactly what she’s doing in creating a Gothic palette of imagery including ideas of purity, virginity, death, humanity and brutality which crop up time and time again throughout the collection. The characters in the collection are all in some way flawed, Carter was criticized by feminists in 1979 (when this book was first published) for her portrayal of woman in this book. I think this criticism completely misses the mark as every woman in this collection is unique and complex, some on the surface are brutal villainous figures but turn out to be victims of their families’ expectations, like in the story ‘The Lady of the House of Love’ about a vampire trapped by her condition. While others are on the surface innocent flowers but are lust-filled, schemers underneath, as in the title story. Rather than doing a review of every story in the collection I thought I would do a short review of one of my favourite stories in the book which these is ‘The Werewolf’. This story is one of the shortest in the collection, spanning only three pages, but what it lacks in word count it makes up for in impact. The story is a retelling of the Red Riding Hood story that we are all in someway familiar with from childhood. Carter’s version is set in a medieval village plagued by superstition. The “good child” becomes her own hero, taking her “father’s hunting knife” out in her woodland journey. The story is rich with supernatural imagery, references to witchcraft and the devil. The main character is truly a wolf in sheep’s clothing who schemes against her grandmother and even gets her killed by a mob in order to prosper. This collection of beautifully written short stories deserves its place in the literary canon and then some, the quality of the writing surpasses many of the other texts I’ve read as part of my course this year. It’s originality and shock-factor when it was first released I think has has a profound cultural impact, with recently released films like ‘Into The Woods’ and ‘Snow White and the Huntsman’ similarly retelling fairytales in a much more violent and sexual way. 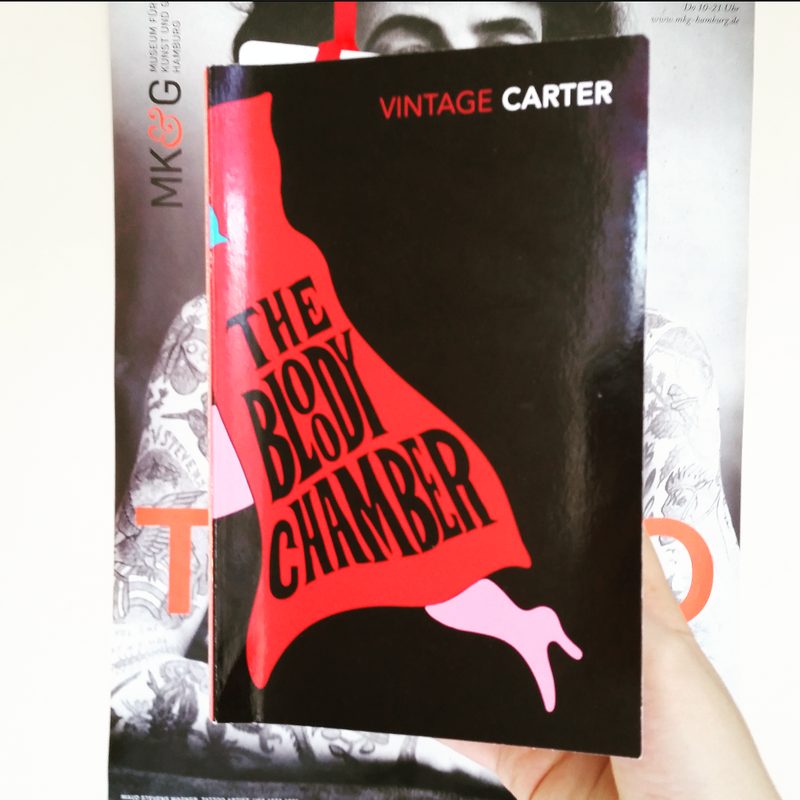 Angela Carter’s collection is just as fresh as it was when it was first released and I highly recommend giving it a read.